I was thinking about a recipe the other day that was one of my best. I thought I would share with all of you – the best of the best. Below are my top 10 in no particular order. 1. Grandma Reith’s Spaghetti Sauce – I lied, this is probably my favorite recipe. 2. Mom’s Cheesy Hash Brown Potatoes – This is the best cheesy potato recipe and I’ve sampled quiet a few. 3. Concord Lutheran Church Cookbook Meatballs – These go great with the potato recipe. 4. Chicken Penne Pasta with Salsa Con Queso – This recipe has a nice little kick. 5. Chocolate Crinkles – My mother made these when I was a kid but I love my recipe even more. These are probably my signature item. 6. Grilled Shrimp & Basil Orzo Pasta – Fresh basil and feta cheese nicely accent this dish. 7. Canyon Chicken – Chicken, ranch, cheese, and bacon. You can’t go wrong this recipe. 8. Lasagna Twist Around – Reminds me of my Grandma Reith Spaghetti Sauce. 9. Aunt Linda’s Slushies – I’ve made and drank a number of drinks over the years. This is my absolute favorite. 10. Cheesy Potato Soup – It’s as close as you can get to the O’Charley’s soup. I miss that restaurant so much. My mother hated potato soup as a child. It is my understanding that she was forced to sit at the dinner table until bedtime on the nights my grandma made it for dinner because she refused to eat it. One of the reasons my mother said she didn’t like it was because she hated warm milk. That said, she will drink hot chocolate made with dried milk. 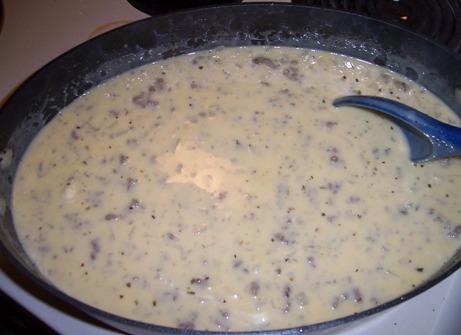 This potato soup recipe has meat and cheese. You can’t go wrong with that. I’m pretty sure I got this recipe from Misty’s Facebook Recipe group a couple of years ago. I hope you enjoy this hearty soup as much as I do. In a large pot, cook beef and onion until over a medium heat. Stir in basil and parsley. Add potatoes and broth. Bring to a boil, then simmer until potatoes are tender, about 10-12 minutes. Melt butter and flour into soup. Add milk stirring until smooth. Gradually add milk, stirring constantly. Bring to a boil and reduce heat to a simmer. Stir in cheese. When cheese is melted, add sour cream and heat through. Do not boil. Notes: To make it a little healthier, I used low fat sour cream, 2 percent cheese, low sodium broth, and skim milk.